Is The Loneliest Job In the World Getting Lonelier? 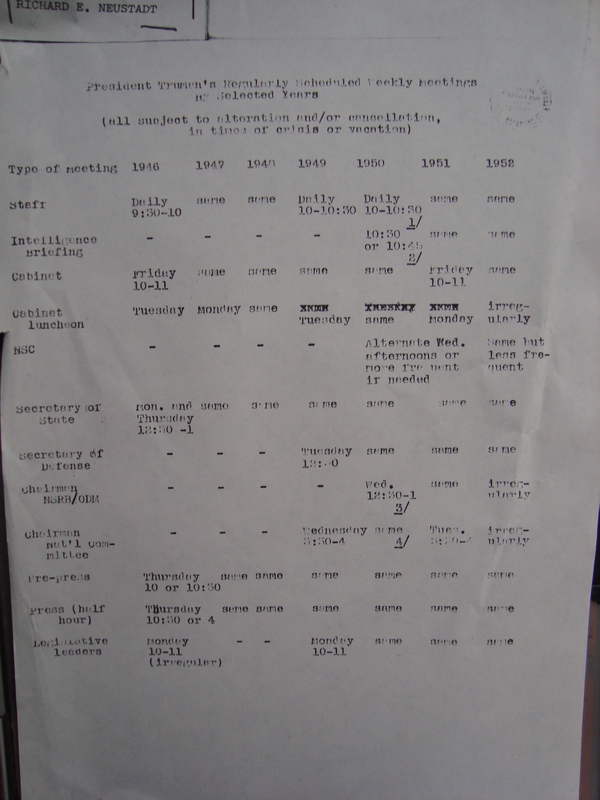 In looking at Truman’s regular schedule of meetings, there are several items of particular interest. First, he operated without a chief of staff, choosing instead to manage his staff on his own. This meant scheduling a daily staff meeting with his senior White House aides, during which he would hand out assignments and receive oral reports. By all accounts this was a tremendously helpful administrative exercise, not least because it kept each senior aide apprised of what his colleagues were doing. Presidents have long since given up this practice, choosing instead to delegate staff oversight to a single senior aide. Second, Truman does not begin daily intelligence briefings until 1950 which, not coincidentally, marks the start of the Korean War that June. Interestingly, however, those briefings were conducted initially by General Omar Bradly, who was serving as the first chairman of the newly created Joint Chiefs of Staff, and not by the CIA director or a personal White House equivalent to the national security adviser. Third, Truman met weekly with both his full cabinet and with the press. Neither practice continues today. Most of Truman’s successors, beginning with JFK, complained that the cabinet had become simply too large and unwieldy to justify regular cabinet meetings. Instead presidents have opted to meet with smaller, issue-based cabinet councils, usually under the direction of a White House aide. At the same time, for reasons I discuss here, presidents find regular press conferences far less useful than in Truman’s day. But perhaps of greatest relevance to today are Truman’s regular Monday meetings with the congressional “Big Four” – the House Speaker and majority leader, and the Senate majority leader and president pro tempore. In addition to these weekly get togethers with the congressional party leadership, however, Truman’s schedule is studded with additional meetings with senators and representatives of both parties. Neustadt’s notations indicate that many of these meetings dealt with regional issues of concern to the particular member of Congress, while others dealt with national policy. For example, in June 1947 Truman met with Senator John Overton to discuss flood control in Louisiana, with Alabama Senator John Sparkman “re War Dept. run out on cotton”, and with House Labor Committee Republicans to discuss their opposition to the Taft-Hartley act – just three of 13 separate meetings with senators and seven more with representatives Neustadt records for that month. I thought about Truman’s remarks after having dinner recently with a former member of the House who remains in somewhat close contact with current members of Congress. According to him, legislators on Capitol Hill from both parties do not believe President Obama is sensitive enough to the need for reaching out to the Hill on a regular basis. Of course, this is a complaint one hears voiced on a frequent basis in media reports, but it is difficult in the absence of records like Neustadt’s to verify just how often the President meets with his legislative counterparts. If true, however, it may explain in part why a President – and former Senator – ostensibly committed to changing the culture of Washington has apparently made so little headway toward reaching this objective. The Presidency is already the loneliest job in the world. Truman’s words, and actions, are a reminder that it makes no sense to further the isolation by failing to reach out regularly to those with whom you share power. 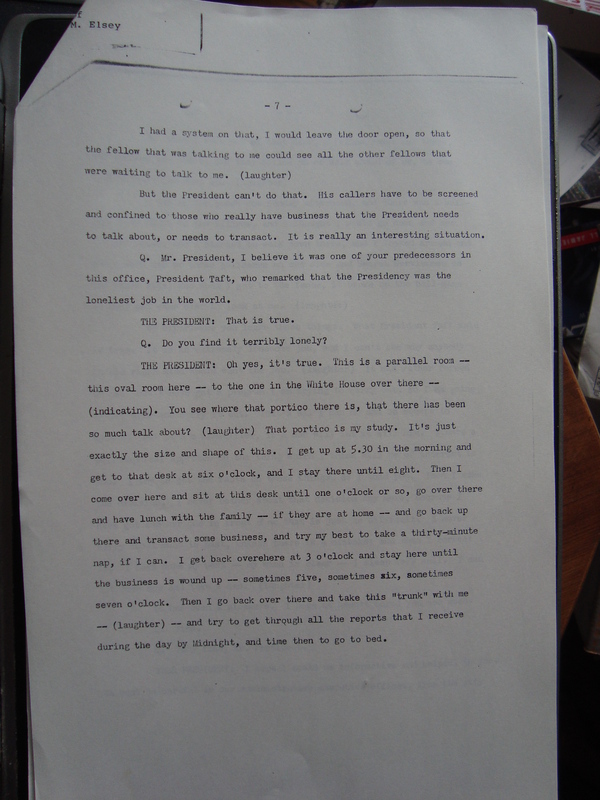 Neustadt compiled the date regarding Truman’s schedule while he was working in the White House. In my years poking around presidential archives, I haven’t found a similar look at a president’s schedule – but maybe that’s because, as you suggest, there’s not a “Neustadt-like” person serving these other presidents! However, scholars have tried to create similar documents by analyzing presidential appointment books. If I can dig up some of these studies I’ll post something. Matt, When Roosevelt was re elected in 1944 he was very sick and probably knew he was dying. Yet he never brought Truman into his confidence; never even told him about the atomic bomb. No wonder Truman was lonely. Question, was this partly FDR’s doing, in his isolating of Truman from his administration? Great question. In my view FDR’s decision not to bring Truman into his confidence reflects a certain arrogance of power – a belief that somehow the laws of physiology didn’t apply to him. This is actually the strongest reason of which I know for why we should have the 22nd amendment. Let me devote a full post to my idea – I’ll post it tomorrow morning.